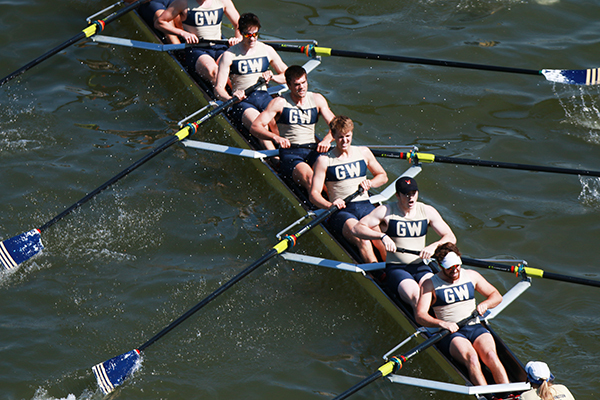 Men's rowing races on the Potomac River earlier this season. The Colonials raced in the Eastern Sprints against many of the nation's top crews Sunday. Men’s rowing races on the Potomac River earlier this season. The Colonials raced in the Eastern Sprints against many of the nation’s top crews Sunday. GW tied the University of Pennsylvania for 10th in points for the Rowe Cup which Harvard and Brown tied in winning. Each Colonials boat finished in the same place in which they were seeded in the Eastern Association of Rowing Colleges Championships. The Varsity Eight, ranked No. 15 in the nation in the most recent USRowing coaches poll rowed the length of the course in 5:48.966 in their morning heat to finish in fifth. Dartmouth narrowly edged GW for a berth in the petite finals by finishing less than two seconds ahead of the Colonials at 5:47.500. “[The Varsity Eight] had a good race in their heat but not a great race, and they needed a great race in order to get top four and get into that petite final,” Davis said. Davis said the crew was somewhat discouraged with the result, but shook off their disappointment to row the most complete race of their season in the third-level finals. The Colonials won, and lead the entire way. The crew has had fast starts all season but has struggled during the sprint at the end of races. GW was able to make a move on second-place crew Syracuse in the final 500 meters, maintaining a 42 stroke-per-minute rate while pouring power into each sweep of the oars to win with a time of 5:41.712. Yale edged the Second Varsity Eight into fifth by less than one-tenth of a second in a race that Davis called “heartbreaking.” The Colonials led the Bulldogs for much of the race but were passed at the very end, losing out on a lane in the petite finals. The narrow defeat put a weight on the boat’s third-level finals race, in which they placed second with a time of 5:55.275, about five seconds behind the winning crew from the University of Pennsylvania. The Colonials were able to improve their time relative to UPenn from earlier this year by just under two seconds. The Freshman Eight was the only boat to earn a spot in their grand finals race after placing third in their heat. Higher boats needed a first or second place finish to make the grand finals, but a smaller fleet of rookie boats meant the Colonials time of 6:03.124 was enough to earn them a spot in the race. They finished fifth with a time of 5:48.998. The close races were upsetting for GW, which came out on the wrong end of tight battles, but the Colonials proved that they could contend with some of the nations best boats. Brown, Princeton, Yale, Harvard and Wisconsin are among the top-20 squads in the nation, according to the most recent USRowing coaches poll, and all took to the water Sunday. The Colonials have less than two weeks to pick up boat speed in preparation for the IRA National Championships in West Windsor, N.J.